and the Lipschitz-Saal is the main lecture room on the first floor of the building. The poster exhibition and the coffee breaks will take place in the Plücker-Raum (next to the Lipschitz-Saal). 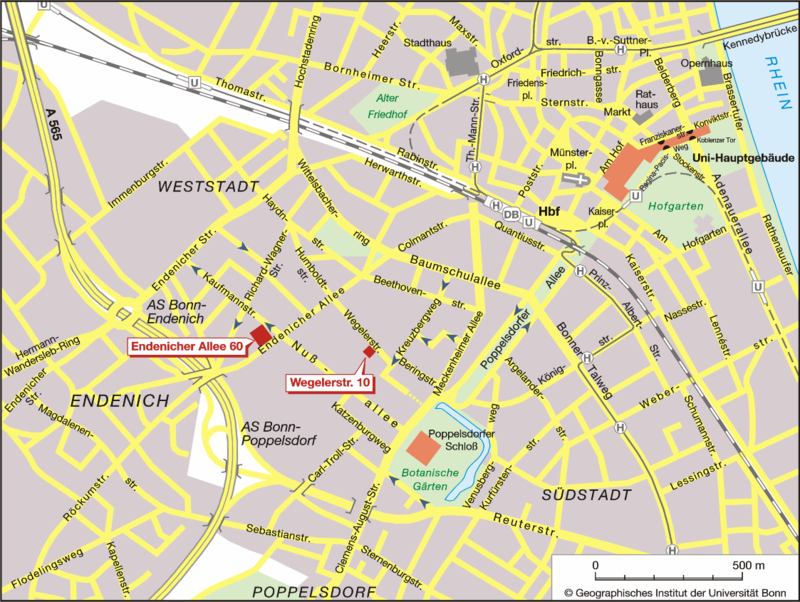 The nearest airport is Cologne Bonn Airport, but you can also easily travel via Dusseldorf or Frankfurt airport. There is a bus (SB60) going directly from Cologne airport to the central station of Bonn (Bonn Hauptbahnhof) every 30 minutes. By train, the nearest station is Bonn Hauptbahnhof (Hbf). The walking distance from the station to the Mathematical Institute is 10 minutes. You can also take a bus from the station to the Mathematical Institute: The bus stop Kaufmannstraße is located right in front of the building. Lines 604, 605, 606, 607 (from and to the main train station Bonn Hbf), line 631 and night bus line N2 (after midnight) stop here. All hotels are within walking distance (at most 15 minutes) from the Mathematical Institute. The conference dinner will be at DelikArt (located at LandesMuseum Bonn, on the way from the Mathematical Institute to the central station). Lunch on Thursday and Friday will be at our canteen next to the Mathematical Institute. On Saturday, we will provide some snacks for lunch.